Myryad develops piano black bookshelf speaker | What Hi-Fi? 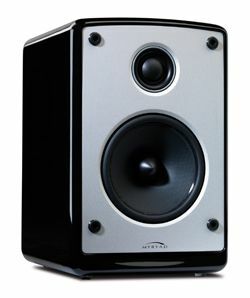 Myryad, best known for its electronics, has developed a new piano black bookshelf speaker, the £350/pair A170. The two-way design has a brushed aluminium front baffle, 25mm tweeter, 12.5cm mid/bass driver and sensitivity of 88dB/w/m. Powr handling is 25-100W. It's shown above with the Myryad Mi all-in-one hi-fi system. "The Myryad A170 has been designed to meet the highest expectations of both dedicated stereo audiophiles and everyday music lovers," says brand manager Alex Munro. "The bi-wireable, two-way reflex design combines deep, powerful bass with sweet, accurate treble." The Myryad A170 speakers are available now through authorised dealers. They're distributed in the UK by Armour Home.